Home Food & Drink Corned Beef and Cabbage: Classic Irish Fare? St Patrick’s Day is synonymous with corned beef and cabbage, isn’t it? Well, in fact the answer to this question rather depends on your location. For Irish-Americans, it is a meal with a deep tradition, enjoyed all year round but relished especially on March 17th. In Ireland, though, the dish is seldom eaten by the native population, and it certainly has no particular association with the country’s patron saint’s day. It’s conceivable nowadays that, if you find yourself in Dublin or Cork around “St Paddy’s Day”, you will find it being offered on restaurant menus, but this is largely a concession to visitors from overseas, especially the United States. 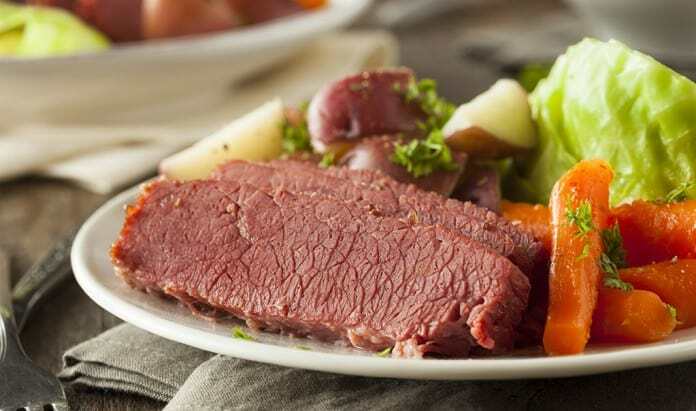 Substantial, economical and comforting, however, the delicious combination of flavoursome corned beef and cabbage does have its roots in Eire and is essentially an evolution of that other real Irish classic, bacon and cabbage. The latter, of course, has influenced cuisines around the world and is reflected in a range of dishes, from the New England boiled dinner to the panackelty or pan haggerty of north-east England. In this short article, we look at the history of the union of humble salt-cured beef and greens and how it became such a vital part of the Irish-American tradition of celebrating St Patrick’s Day. The proper starting place for this story is probably the beautiful city of Cork in the south of Ireland, which, from the sixteenth century onwards, was at the very forefront of processing and exporting meat, most notably beef. Corned beef was, in general terms, salt-cured, its name deriving from the now obsolete English word for large grains of salt, “corns”. As expert as the Irish were at the process, the locals rarely ate the product of their industry, with poverty largely restricting them to the cheaper salt pork, which they often eked out with vegetables, especially cabbage. Most of the Irish corned beef was exported to the more affluent parts of Great Britain and France and their colonial territories abroad – at least until the abolition of slavery and later the decline of those empires dramatically reduced demand for the product. During the eighteenth and nineteenth centuries, many Irish people were forced by famine and political strife to emigrate to the New World. They naturally wanted to retain their heritage and customs and – as far as possible – cooked familiar foods. Cured beef, much of it imported from the old country, was more plentiful in America than bacon, but its salty, savoury flavour complemented cabbage perfectly, and it soon came to be loved as much by Irish-Americans as salt pork was by their forebears back home. St Patrick’s Day being an occasion on which people of Irish descent across the globe celebrate their roots, it was perhaps inevitable that the dish would become an integral part of the celebrations. A fascinating footnote to corned beef’s emergence in America is that it happened roughly simultaneously with the arrival in the country of large numbers of Jewish immigrants, themselves escaping hardship and seeking new opportunities, who ate the very similar kosher beef. 1. Place the corned beef in a large pan with the onions, carrots, mustard powder and herbs. Cover this with cold water. 2. Bring the contents of the pan to a rolling boil, then reduce the heat and simmer for an hour, occasionally skimming off and discarding any fat that has risen to the surface. 3. Take off the outer leaves of the cabbage, and rinse and cut the remainder into quarters. 4. Add the cabbage to the pan and cook for at least another hour (probably more like two). 5. Taste and then season accordingly. 6. Serve the corned beef cut into substantial slices, with the vegetables, on a large platter. The finished dish of corned beef and cabbage, as with bacon and cabbage, is nowadays enjoyed with an appetising pile of buttery potatoes and a variety of fairly spicy condiments – typically hot English mustard and/or horseradish. Many cooks have developed their own tradition, though, and you will sometimes see the platter sitting next to a basket of warm, crusty bread, root vegetable mash or Colcannon. Of course, it wouldn’t be St Patrick’s Day if you didn’t have a pint of Guinness to accompany your meal. Just as with the Thanksgiving and Christmas feasts, the leftovers of both a bacon and cabbage meal and corned beef and cabbage have become a large part of the tradition of St Patrick’s Day, with families enjoying next-day specialities such as bubble and squeak and even sandwiches prepared from the delicious remains. The latter is especially welcome if you’ve availed yourself of a little too much of Ireland’s black nectar on St Paddy’s Day! We hope you enjoy the celebrations.